It’s Halloween and what’s scarier than a big, loud steam engine? I’m not so sure I’d call this a car so much as a locomotive that can be driven on the street. I mean, look at the crew involved to operate it. It’s incredible! This vehicle was designed by a member of the Salvesen family, a wealthy Scottish family involved in shipping and transport since the 1870s. It is powered by a coal-fired boiler, two-cylinders and chain drive. The photo above shows a pull cart behind but the catalog photography does not. It has two rows of seating. It was part of two large collections spanning many decades. The current owners bought it in 2004 and it has competed in every London-to-Brighton run since, failing to finish only once. 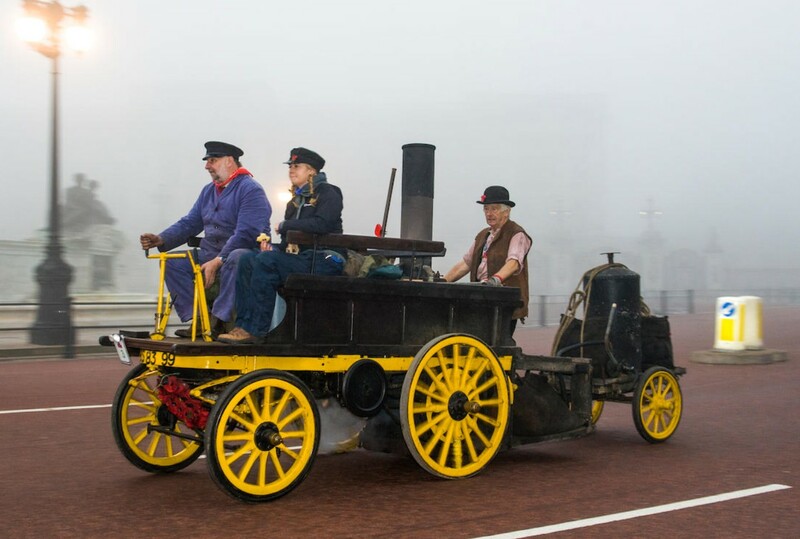 This one-of-a-kind vehicle from Victorian England is truly awesome. That it still runs and is driveable is icing on the cake. This could be a once-in-a-lifetime opportunity and it’ll take between $200,000-$270,000 to take it home. Click here for more info and here for more from this sale. This entry was posted in Uncategorized and tagged 1896, auctions, Bonhams, cars, classic cars, salvesen, steam cart, trains by classiccarweekly. Bookmark the permalink.